What type should you initialize your disk? MBR or GPT? This article will tell you why and the difference between them. And how can you convert between MBR and GPT with AOMEI Partition Assistant. When Will You Encounter this Question? 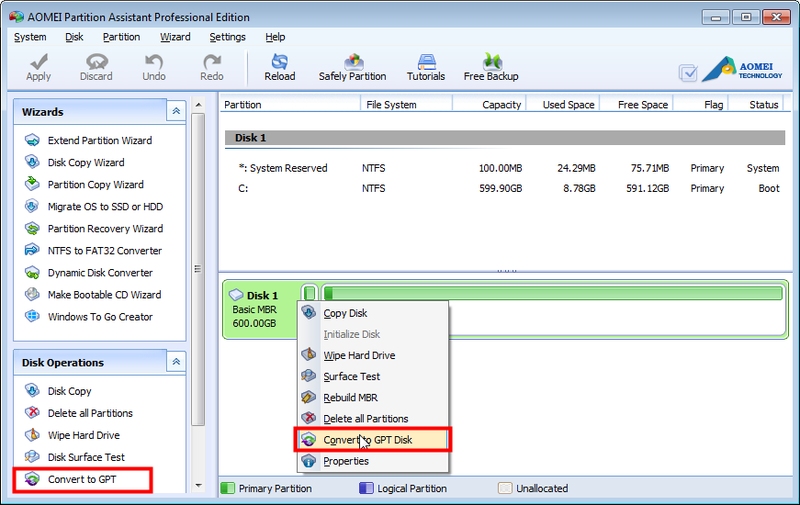 What’s more, MBR disk supports four primary partitions or three primary partitions and one extended partition. By contrast, GPT disk supports theoretically unlimited partitions. To sum up the above explanation, you can decide to initialize your disk to MBR or GPT. How To Change The Initial State? However, when you want to change your disk style but not want to reinstall OS or delete all existing partitions. Is there a safe and simple way to do this? Yes! AOMEI Partition Assistant is a piece of professional partition management software and is able to convert between MBR and GPT without data loss. When you use AOMEI Partition Assistant to convert GPT to MBR or convert MBR to GPT, it provides preview during the whole process. Once you want to stop the conversion, you can click “Undo” on the toolbar to cancel it. Thus decrease accidental operations to the minimum degree. You can also backup your disk in advance just in case. AOMEI Partition Assistant is a professional and easy to use partition tool. Besides converting between MBR and GPT. You can also use it to extend your system partition, rebuild MBR, split partition and check errors. More functions you can find from here.